You are looking at the # 1 BEST HIGH GRADE AND QUALITY 316L polished 10 gauge Stainless Steel Laser cut locking bracket with a 9/16" hole for bigger locks on the market today! Its 1 1/4'' width helps it fit better and snug in the cooler slot. 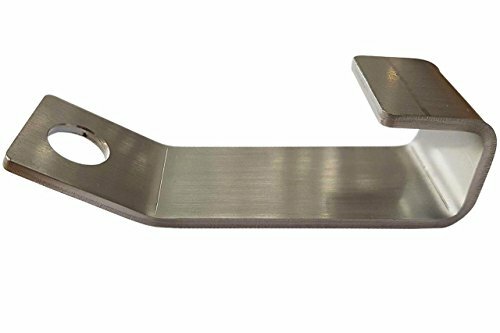 This bracket is cut from 10 gauge 316L Stainless Steel 1/8" thick material which is thicker and stronger than 14 gauge and 11 gauge brackets in the market today. The hole has been machine countersunk so there are no sharp edges like a square hole that serves no purpose would have. These edges are known to tear into your lock or cable. With my bracket this will not take place. Its quality is unmatched with its polished texture and finish and rounded and smooth edges unlike other brackets and there sharp edges and powder coated texture that will chip in time. Does not have sharp and rough edges to cut your hands. Fits Yeti Tundra and Roadie Coolers! Will also fit RTIC Coolers, Igloo 55 Quart Sportsman Ice chest Cooler,Grizzly Coolers and any other cooler with slots for locking and mounting purposes. 316L has a very high corrosion resistance in chloride environments, architecture and marine applications. Stainless Steel 316L works very well against corrosion in various atmospheric environment's, especially in hard and acidic waters. One of 316L strongest properties is its heat resistance. It can with stand temperatures of up to 870 degrees Celsius. NO other metals should be used with the Yeti Cooler or can hold up like 316L Stainless Steels higher tensile strength and stress rupture. This locking bracket is made from the best high grade Stainless Steel just as your Yeti Cooler is made from the best materials that puts it ahead of the competition. No Lock or Cable Provided ! Yeti Cooler Bracket Made from 316L (Ultra-Low carbon steel) will never rust !